Green Businesses: The following is part of an occasional series of articles talking to local business owners about their efforts to run a sustainable business. As consumers, we have choices regarding where we shop and what we buy. In 1973, a group of Saskatoon residents decided to establish the city’s first cooperative food store. Initially a buying group, Magpie Food Co-op opened in Caswell Hill in 1976-77. 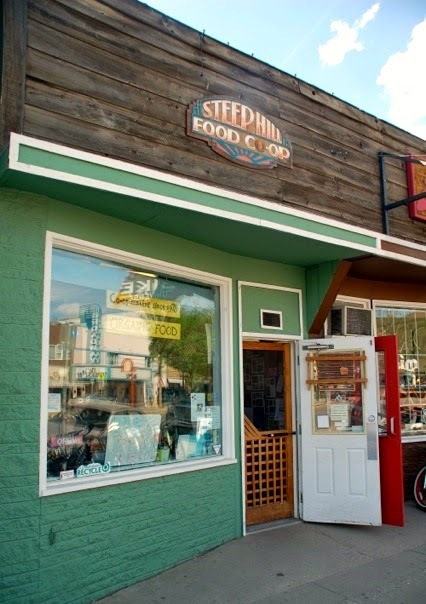 A second, Steep Hill Food Co-op, opened on Broadway Avenue in 1978 and has been in its current location since 1980. The Co-op’s goal is to offer high quality food and household items at a fair price. As much as possible, their products are local and organic. They buy fair trade products when they are available (coffee, bananas, cocoa, sugar) and they offer local farmers fair prices. As much as possible, they buy from ethical companies, but they recognize that the store would be half empty if they eliminated products owned by large corporations. The Co-op has always made bulk purchases. When they started out, they simply opened a box, put a scoop in it, and let people help themselves. Later they moved to bulk bins but found that there was a fair amount of spillage and customers found it more convenient when most goods were packaged by member-workers. “Bulk bins were messy and time consuming and took up too much space,” says Gerry Yakimoski, store manager. However, in-store packaging continues to be as simple as possible. Steep Hill doesn’t provide new or used plastic shopping bags. Customers are expected to bring their own and, if they forget, there are a few grocery boxes – or you can stuff it in your pocket. Bulk purchases from local and environmentally conscious companies means that there is minimal packaging waste. “Most companies are really good,” Gerry says. “They use crumpled paper.” One company uses cellulose packing peanuts; the Co-op passes them on to a local distributor for reuse. Cardboard is flattened and members take it away for recycling. Overripe fruit and vegetables go in compost pails and members pick it up and add it to their own compost piles. “We average one small garbage bag a day, and it’s primarily the tape off the cardboard boxes,” Gerry says. Steep Hill works hard to minimize waste by tailoring their orders to match their customers. “We would rather be out of something for a couple of days than have to throw things out that are out-dated,” Gerry explains. It’s not easy so they may run out of something one week and have too much the next. But a 2% average loss is low compared to the industry average. It probably helps that they have long-serving staff with plenty of experience. Gerry has worked for Steep Hill Co-op since it started, and Andrée Schmiedge, the assistant store manager, has worked at the Co-op for a number of years. In a culture that values continuous growth, it’s refreshing to see a business that is content to stay small. Memberships cost $20 a year (plus GST). Working members spend two hours a month packaging bulk foods, shelving groceries and cleaning. They pay the shelf price for their groceries. Non-working members pay shelf price plus 13%, while non-members pay shelf price plus 25%. The vast majority of purchases are made by working members. Non-member purchases are only 7-8% of the store’s total revenue. “We have 50 to 60 people who use the Co-op as their principal food supplier,” Gerry says. 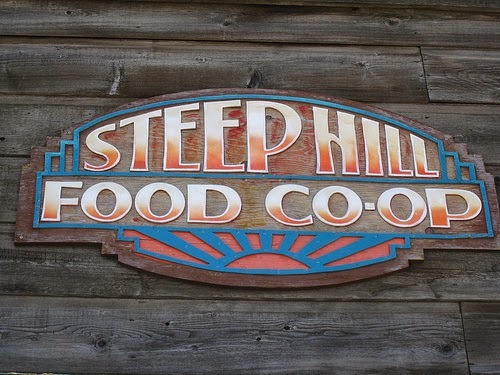 Steep Hill Food Co-op is not designed to make a profit. They determine their shelf price by adding 10-25% to the cost price rather than using the suggested retail price.